Are you ready for an Artful Autumn Get-Away? Autumn in the low country of South Carolina.... kiss the humidity goodbye and say hello to perfect Carolina blue skies and temperatures that will sooth your soul. Plan an Artful Autumn Get-Away and visit the delightful destination of Beaufort, South Carolina. I am excited to join forces with Beaufort County's own Laura Lee Rose, a Clemson Extension horticulture agent and one of the area's foremost advocates of horticulture. She teaches the Master Gardener curriculum, oversees county-wide horticulture projects, speaks to schools and community groups, and has been active in organizing and promoting Beaufort's downtown community garden. Learn sketching, page design, watercolor, lettering and artful journaling techniques from Pam and valuable plant identification, information and other horticultural goodies from Laura Lee. 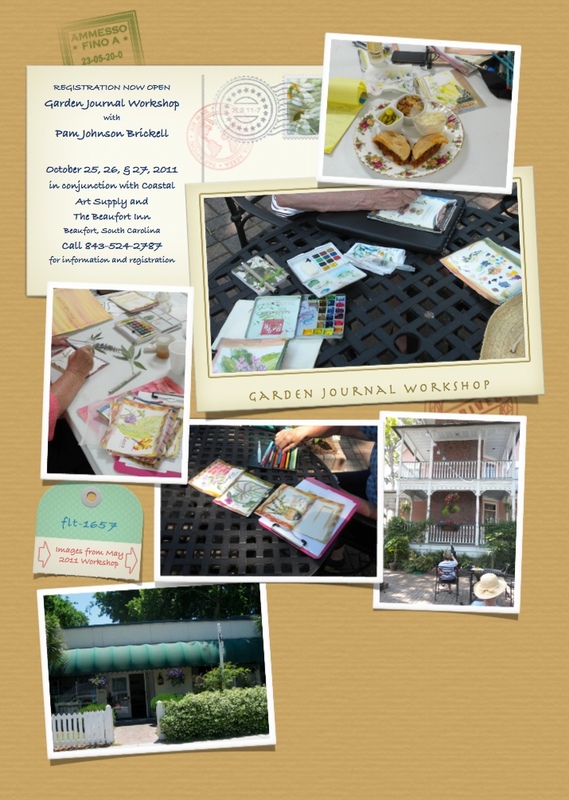 By the end of the workshop you'll experience the joys of keeping a garden journal and discover first hand how it can be utilized to plan your garden and serves as a record of your gardening trials and triumphs. I'd be remiss if I didn't mention.... lunch is provided by Southern Graces... Yum! The Beaufort Inn and Beaufort, South Carolina. Oh this sounds wonderful. Wish I could be there. Thanks for your nice comments about Annie. She is doing much better today. Now our troubles begin tho.. Keeping an Active Border Collie down for two weeks. yikes. Color me stressed still. So its relaxing to come see what everyone is doing here in blog land. This looks wonderful, wish I were closer. Just took care of someone headed to Bluffton. Do the gardens have a second wind in the fall? Thinking they are somewhat dormant int eh summer heat.